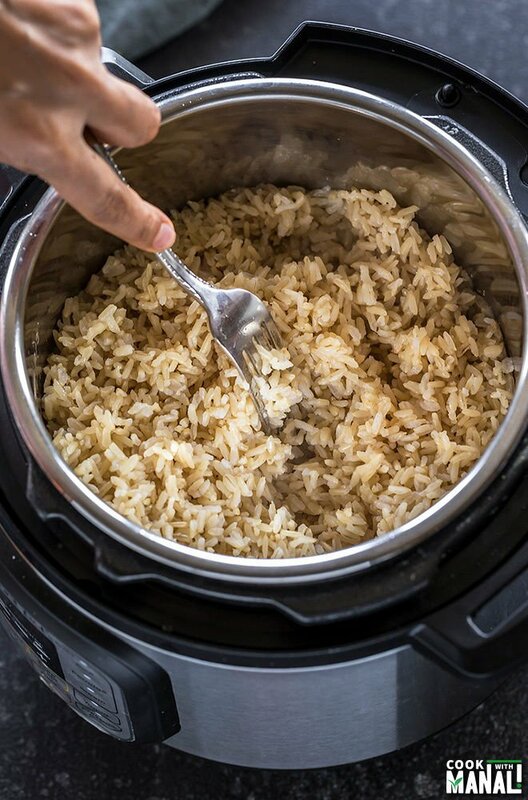 Instant Pot Brown Rice – step by step guide to make the perfect brown rice in your Instant Pot each time! This is like a never ending debate! I grew up in a family where rice was eaten every day. A meal would just not be complete until there was rice on the table. That’s because we belong to a region in India where rice was grown in abundance and my grand-father was a farmer, so we had rice farms! And since there was so much rice, it was obviously eaten all the time. Growing up I never thought if rice was good or bad. However in spite of growing up in such an environment I never became a rice fan. I don’t know why! While no one in my family could finish their meals without rice, I chose to avoid it whenever I could. I always preferred my roti (flatbread) and eating rice seemed like a chore. All the rice in my home was always white. I didn’t even know about brown rice until I grew up and it became a trend! 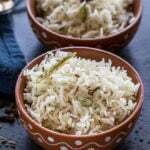 And hence came the debate that which rice is better for you – brown or white? Both white rice and brown rice are high in carbohydrates. White rice is basically brown rice minus the germ and the bran. Because brown rice contains the whole grain it is said to be a healthier alternative. It has more fiber, minerals and vitamins than the white counterpart. But according to some studies, white rice is more easily digestible and hence a better alternative for the gut. So which team are you? Brown or White? I make white rice very often since Sarvesh would only eat that but ever since I got my Instant Pot, I have been making brown rice quite frequently too. Obviously I eat it all by myself! Actually, I always prefer brown rice over white rice while eating out especially Asian food. Yes for my dal, I need white rice since I grew up eating it this way and it’s hard to change habits. But for everything else, I do prefer the brown rice over the white rice. Like with this Thai Peanut Tofu Curry or this Sweet Potato Curry! Even though I always liked brown rice, I never made it very often and the reason was that I could never get it right on the stove top. Also I didn’t like to baby sit and stand in front of the stove while it cooked. But not any more! 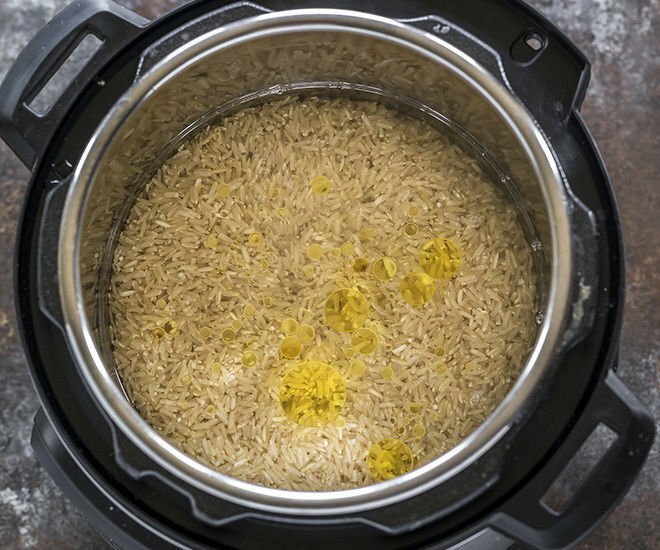 It’s just so easy to make brown rice in the Instant Pot! I thought it will be nice to share my full-proof recipe with you guys since I have been making it regularly. Hope you guys find it useful. ✓ is really easy to make in the IP! ✓ no need to baby sit, just add everything to the IP and you’re done. 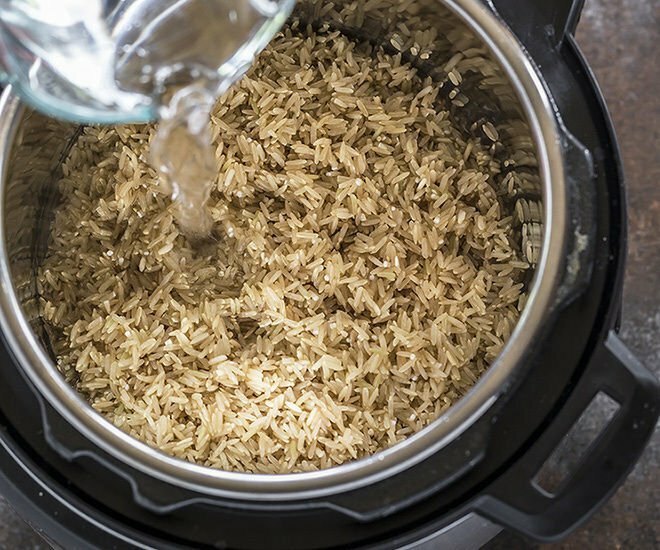 Rinse brown rice under running water. Drain the water and then add it to the inner steel container of your Instant Pot. Then add water to the pot. Then give it a quick stir. 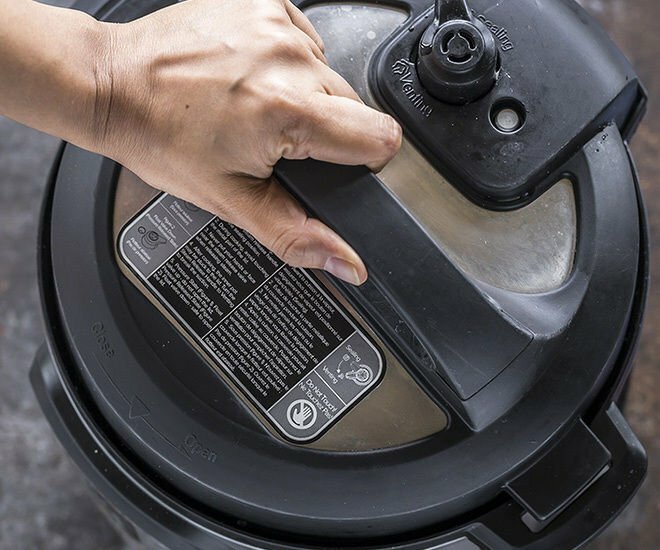 Close the Instant Pot with its lid. Press the manual or pressure cook button and cook on high pressure for 24 minutes. Make sure the pressure valve is in the sealing position. Once the 24 minutes are up, let the pressure release naturally. Open the pot and fluff the brown rice with a fork and enjoy! 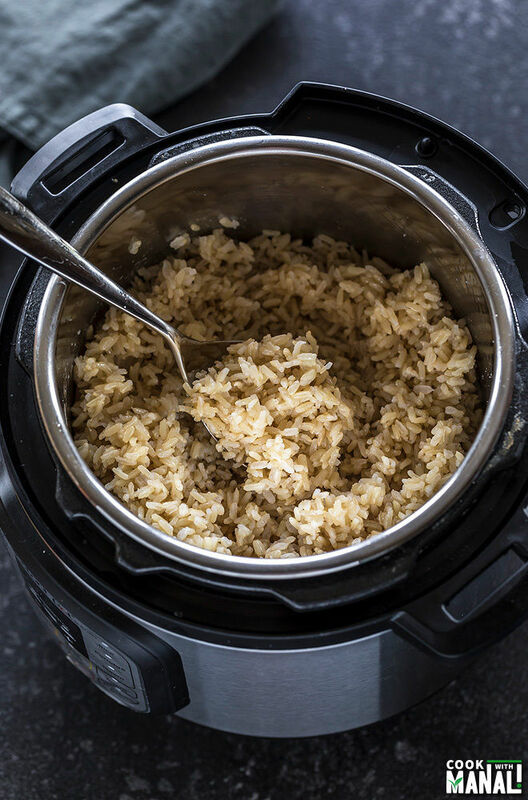 If you’ve tried this Instant Pot Brown Rice Recipe then don’t forget to rate the recipe! You can also follow me on Facebook, Instagram, Pinterest and Twitter to see what’s latest in my kitchen! 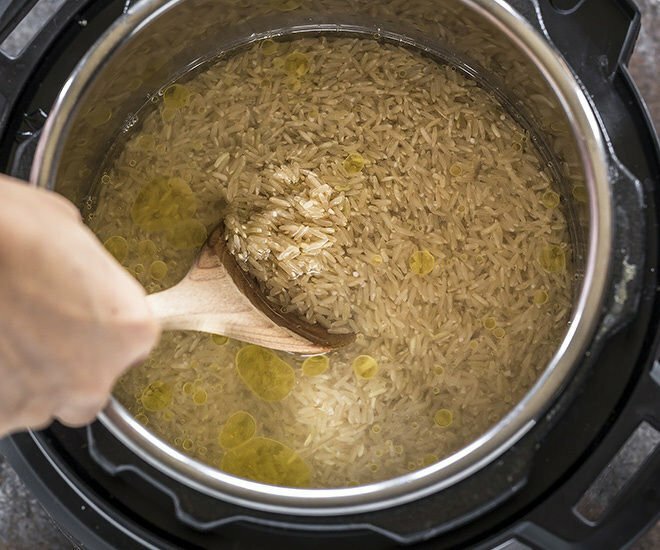 Step by step instructions on how to make Brown Rice in the Instant Pot. 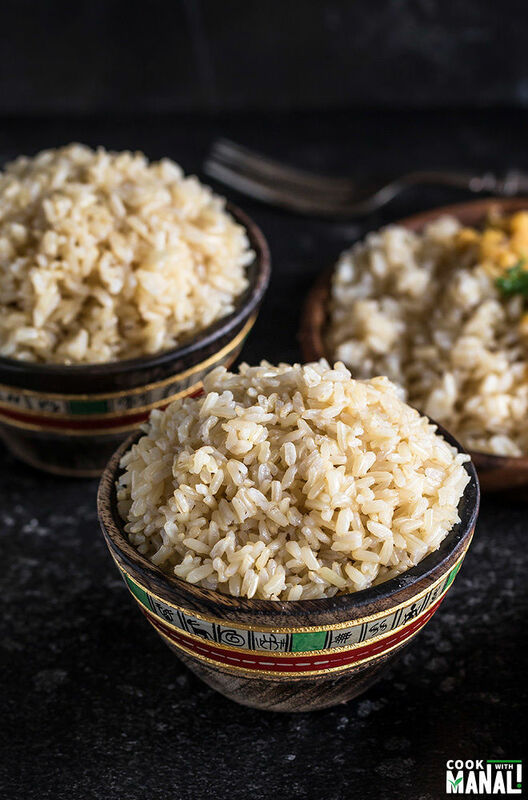 This full proof recipe results in perfect brown rice every time! Then add water to the pot along with olive oil and salt. Give a quick stir. Once the 24 minutes are up, let the pressure release naturally. Open the pot and fluff the brown rice with a fork. Enjoy with any curry or your choice! You may skip the oil and salt. I like the texture and flavor more with the salt and oil and hence add it to mine. Very fluffy and delicious! IP makes life so much easier, right? I have tried this several times an it just doesn’t work. Could it be the rice? I just purchased at my local grocery and there is no date on it. The stove top method is worse. hmm I am not sure at all..it’s such a basic full-proof recipe, I make brown rice all the time in my Instant Pot all the time.. what exactly is the problem that you are having? Is the rice still uncooked? Are you using parboiled rice? If so, that may be the problem. What about short brown rice . You cook it the same way as long brown rice . I guess so, never tried with short brown rice. Just Made with short brown rice and sesame oil exactly as your recipe calls for (24 mins, NR), and it was perfect!!! Are you kidding me? 24 minutes? I cooked first time brown jasmine rice like brown rice itself according the manual of IP, and it said only 4 minutes in PC and than Natural Release from 10 minutes and up. And rice was fully cooked. Has anyone ever tried to keep rice for 24 minutes in IP on high pressure? hmm why do you think I will share a totally wrong time for cooking brown rice on my blog? I test everything several times before putting it here…yes brown rice does take 22 to 24 minutes ..and I make it every week this way! 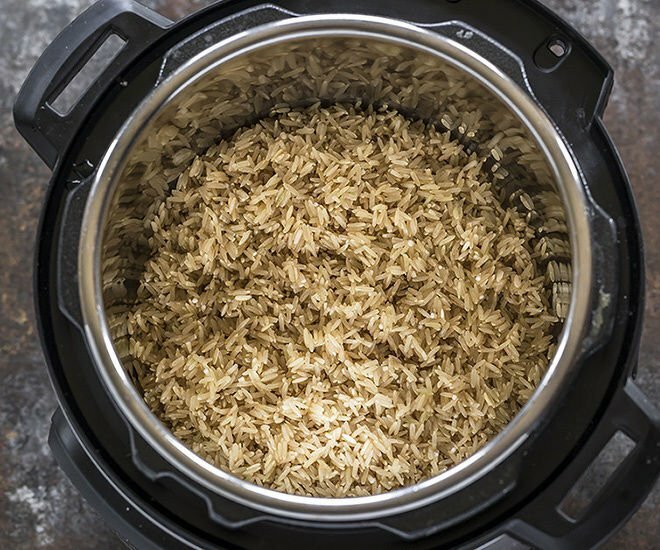 you can search for instant pot brown rice on google and see other recipes as well…they all will have the time in the same range..
Let me chime in on this instant pot ‘smack down’. We got our pot about a month ago. I just made brown rice for the first time, following the 24 minute pressure cook and natural release. It’s perfect. Four minutes would have been raw. Manali, thanks for the help. I have cooked my brown rice the way you describe and it always comes out perfect. Me too. It was excellent and perfect. Doing it again for supper tonight. I do use chicken broth though instead of water. Do you still use salt and oil with broth? It worked perfectly for me too. 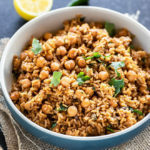 I have used this recipe a number of times with organic jasmine brown rice from my local health food store, and it is perfect every time. I use the Mealthy Multipot on the multigrain setting with the time set at 24 minutes. I have tried another instant pot recipe with a 15 minute cook time and rice was always still somewhat hard with water still left in the pot. This recipe cooks the rice perfectly, excellent liquid absorption each time with no residual water, very fluffy and delicious (especially when sesame oil is added for the oil – yum). Perhaps it is the rice used? I actually just tried my instant pot for the very first time tonight making rice. In the manual, it said for “Perfect brown rice” to do 4 minutes then natural release after 10 minutes. I did that and it was still VERY uncooked when I opened the pot. I will try your way next time. Thanks so much for the tips! I have a new IP. I followed your instructions and the rice was absolutely perfect! Brown rice has always been a challenge for me. So happy! The rice turned out perfect! Thank you! I tried your method Manali and it was a bit to watery for my taste but I’ve not given up on making my IP my go to rice cooker. Next time I’ll try cutting down the time during natural release, and if it’s still a miss I’ll try going for 2 cups water instead. Hmm I would suggest cutting down on the water then if you like drier rice! I’ve been reading other ideas on rice and the NR time seems to be the time it needs to absorb the extra moisture. I’m still new at using the IP and this method was perfect so it was a win for me! agree. brown rice takes the full 24 minutes otherwise undercooked. this recipe works perfectly for me. Hi Manali! Love your blog. If I halve the recipe, do I cut down the cooking time? Thanks! Hi Aliya, I would still cook for around 22 minutes! hope this helps! What brand of brown rice do you recommend based on your experience with different types of rice. I like long grain or jasmine (for brown rice). Hi Manali, I usually cook for 7, so I’m planning on doubling your recipe. Would you recommend that I increase the cook time somewhat if doubling, or do you think I should still stick to 24 minutes? I just started cooking with an 8 qt Instant Pot, so I’m still learning. Thanks! cook for the same time..just double the ingredients! Great, I’ll give that a try right now. Thank you so much for the quick reply! I’ve never ever been able to cook rice but followed your recipe exactly and it’s Perfect…Thank you so much! Approximately how long does the natural release take? I tend to walk away and forget about my rice!! The timer tells me how long it’s been “sitting on warm” (the default setting after cooking I think). I’ve had mixed results because of this. Thanks. around 10 minutes I think..and yes once the pin drops down it will stay on warm mode until you plug it off..
Well I certainly wish I’d read your blog before I did what I did in my IP last night lol. I was attempting to make a version of a brown rice curry bowl. I started by sautéing minced onions, garlic, and the brown rice. I added curry powder, fresh ginger, and tahini. I canceled that pulled the pot out for a few minutes, added equal quantities of water to rice and then set the rice cooking button. Once finished, the rice was definitely not cooked. (I’ve not made white rice in my IP yet but perhaps that rice option works well for white rice?) I had been cooking some frozen stir fry veggies in my wok when I had the not so brilliant idea to add them to the IP and cook them all together on manual at medium heat for 10 minutes. Well the IP never did seal but did cook and suffice to say, it was all a sticky mess (and even burning on the bottom) I’m not sure how long I left it – sometime between 5 and 10 minutes. I added more water (should have used veggie stock), some curry paste, some sesame seeds, and a few nuts. All in all it really didn’t taste too bad (the rice did cook) the veggies were not good (water chestnuts still had a wee crunch). Have you ever been as ill prepared and lazy as me and just wanted to throw everything in the IP? If I’d used fresh veggies perhaps it would have been better? It’s hard knowing liquid levels, cooking heats, and times. Should I have cooked the brown rice in the IP and the veggies with everything else in the wok and not cooked it all together – one pot meal? I know this is a crazy post . . . your thoughts? Hi Kelly, you can pressure cook things which take same amount of time to cook. Like brown rice with soaked beans/chickpeas/brown lentils = perfect! but a stir fry with veggies..white rice would work better..if you cook brown rice with veggies it will be a big mush..since brown rice takes much more time to cook and the veggies would turn mush by then. If you want to add them to brown rice, I would suggest first cooking the rice as mentioned in the recipe, then open the pot add the veggies, and put a glass lid on for 3-4 minutes. That’s enough to steam veggies like broccoli, peppers OR you can toss veggies in a pan and add to the rice. hope this helps! That’s how we do it and it works well for us. We sometimes cook our lentils and rice together but we always wait until last 3-5 minutes to add our soft veggies and works great. Rice and beans/lentils are properly cooked and veggies are still crunchy they way we like them. Also I tried just the brown rice tonight with your cooking instructions and it came out great. 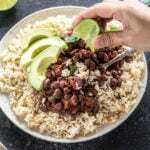 We like adding the different curries but we also make a simple topping out of black beans, red kidney beans and Costco salsa. Just add all together and heat on stove. Then pour over rice and add toppings of your choice. We like cheese, sour cream ( or yogurt ) and fresh avocado. You can also sauté some onions, garlic peppers etc and add to the beans for more flavor/nutrition. Mmm those toppings sound nice! WOW! Yummy, yummy, yummy! Easiest and the BEST tasting brown rice I have ever had. 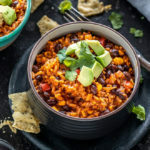 I made this exactly as the recipe called for using plain Publix brown rice and my family loved it! Thank you so much for a healthy rice recipe! awesome! glad it worked for you Lisa! 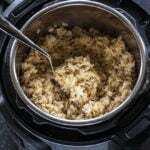 Why do we cook rice on the manual or pressure cook setting rather than the rice setting? This was my first time making brown rice and it came out perfect. It was so good and fluffy. I’m so glad I found this recipe. Thank you! Can this recipe be used with Minute brown rice? Hi! I followed your instructions for a batch of brown basmati rice in my IP, and it yielded what was indubitably the best brown rice I’ve ever made! Thanks Manali!!! I’ve made this several times with Trader Joe’s brown jasmine, it’s great! Sometimes I substitute a cup of broth for one of the cups of water, but otherwise I follow this recipe to a T, comes out reliably well! And easy as can be. Hi…I tried this using Aldi’s Simply Nature Organic Quick Cook Long Grain Brown Rice (which according to bag takes 15-20 min on stove top) I used your portions of water, rice, oil and salt and did high pressure for 20 minutes. We don’t usually like brown rice so I figured I could throw it out if it turned out poorly since I had given myself enough time. It did a LONG natural release since I wasn’t around. WOW! It tasted very good (which is high praise from me) even my youngest who has a bit of a “discerning palate” thought it was pretty good, too. Personally, I think it makes quite a bit more than 4 servings at almost 7 cups cooked…but I guess if you are rice lover….it might be 4 large servings. I will share this recipe with those I know who have an IP like me! Thanks! Hello. I would like to make a double batch (4 cups brown rice). How much water would i use and would it change the time? I got my IP a few months ago it has been SO great but I have not been very happy with the rice I have been making. So I looked at a bunch of instructions online. This one is just perfect! The kids and I could not get enough of it. I think my problem was that I was always using IR. The key is the NR. What I don’t understand is why the NR time is not included in all these recipes. 2 min prep, got it. 10 min to heat up, yup. 24 minutes pressure cooker, seem perfect. 25 minutes for natural release, that’s the longest part of the process and every recipe seems to act like it’s nothing! If that’s what it takes to make it right how do we just overlook this in the meal times. It still takes a full hour to make this rice. Because many people copy/paste others’ recipes (that are also wrong/incomplete). I learned this after trial/error and realized most people who put up recipes on the internet have never actually made it themselves. Also at high altitude, cooking time must be adjusted up by 5% per 1000 ft above 2000 ft elevation. I live at 7000′ and it takes 30 minutes cooking time because water boils at a lower temp the higher the elevation, thus it takes longer. Hope that helps someone out there also frustrated by all the online fake recipes. Sorry about that; I didn’t say, or mean to imply, your site is like the others I was talking about, but I should have clarified your recipe (and site) is indeed spot-on and accurate, as reflected in the proper cooking time for this recipe, and the fact you mentioned you had cooked this many times. I was only answering Justin’s question, after being frustrated by so many other sites, and then finding your recipe here is accurate and a good one I should have mentioned that…very sorry about the misunderstanding! no problem and thanks for understanding! Tried this recipe today, the brown rice came out perfect. I think it’s important to weight the rice, that’s what I did. Confused about the NR. How long is the Natural Release . . . . Sorry, I wanted to like it. I appreciate you sharing your recipes but this turned out like mush for me. I followed the directions exactly and I was so bummed when the rice was way overcooked. I used organic brown rice. Not parcooked. I thought I would post this so readers might try this recipe as an experiment before they rely on it for a meal. I learned the hard way.